During President-elect Donald J. Trump’s campaign against his Democratic opponent, Hillary Clinton, one of his key talking points that resonated with millions of Americans was his promise to “drain the swamp” in the nation’s capital. While few doubt his sincerity, the denizens of the D.C. swamp will not drain easily. In their search to blame others for the dramatic loss by the Democratic Party’s beloved presidential nominee, the Democrats have been blaming the Russian government for hacking into the computer system of the Democratic Party’s headquarters and releasing documents that hurt the Clinton campaign. Seth Rich was allegedly murdered by robbers who stole nothing and who beat him up before putting two bullets into the back of his head. Armed with intelligence reports and the results of an FBI investigation, Democratic lawmakers — and even some Republicans such as Senators John McCain and Lindsey Graham — are claiming Vladimir Putin, Russia’s toughguy president, is ultimately responsible for Hillary Clinton’s loss and Donald Trump’s win. However, several past incidents of intelligence report “re-editing” coupled with FBI and Justice Department politicizing of their probes leave few people believing anything being reported by the Obama administration. Scoffing at the claims regarding Russian hacking, Wikileaks web site creator and journalist Julian Assange implied during a TV interview that a Democratic National Committee staffer, Seth Conrad Rich, who met a violent death was the source of a trove of damaging emails. The rogue web site began posting thousands of documents just days before the Democratic National Convention and continued releasing the damning documents faster than the news media could handle them in the run up to the November 8 election. 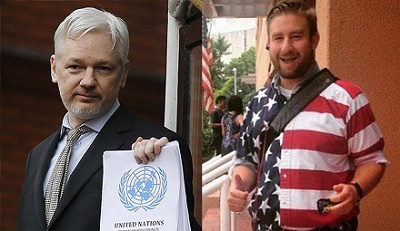 Speaking to Dutch television program Nieuswsuur after he announced a $20,000 reward for information leading to the arrest of Seth Rich’s killer, Assange said the July 11 murder of Rich in Washington, D.C., was an example of the risk leakers undertake and the danger of retaliation. Rich was a 27-year-old man director with the Democratic National Committee (DNC) who was shot and killed as he walked home in the Bloomingdale neighborhood of Northwest Washington, D.C., police and his family said. Seth Conrad Rich died after he was shot multiple times three blocks east of Howard University Hospital, said members of the Metropolitan Police Department on Sunday, July 11. 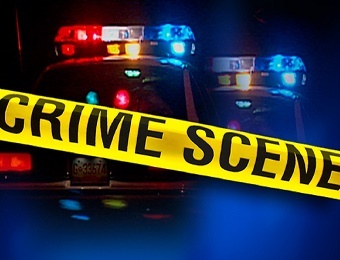 The victim’s mother, Mary Rich, said police told her family her son may have been the victim of an attempted robbery. The U.S. news media treat proven liars Donna Brazile and John Podesta as reliable sources, while they disregard the man behind the release of the DNC-damaging files. public to come forward with any information about the case. Seth Rich held a managerial position at the DNC and part of his job was investigating fraud and other misconduct in the election process for the Democrats. Yet, his murder received minimal news coverage and a tepid police investigation that attributed Rich’s death to a robbery gone wrong. Burkman is also offering a $100,000 dollar reward out of his own pocket for any information that leads to the apprehension of the killers. 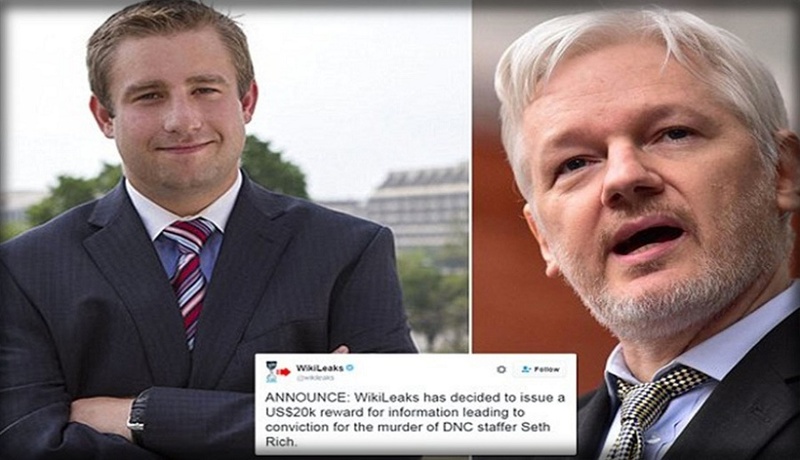 His reward is in addition to those already being offered by Washington DC’s Metropolitan Police Department ($25,000) and by Wikileaks ($20,000). Wikileaks founder and director Julian Assange has embraced several conspiracy theories surrounding Rich’s murder. Assange believes, based on reading thousands of pages of Hillary Clinton’s and the DNC’s emails, that Rich wasn’t killed in a random robbery. DNC Chair Debbie Wasserman Schultz issued a statement mourning the death of Rich, who worked as voter expansion data director: “Our hearts are broken with the loss of one of our DNC family members over the weekend. Seth Rich was a dedicated, selfless public servant who worked tirelessly to protect the most sacred right we share as Americans – the right to vote,” she said.